When disaster strikes, the Federal Emergency Management Agency is there to help, weather permitting of course. Earlier this week Mayor Bloomberg and the federal government touted their new warming centers as a shelter for those in need of food, water, supplies and a little heat. But, as is generally the case with government, when help is needed they’re nowhere to be found. If any are in doubt then they need to pull their head out of the sand and do a reality check. 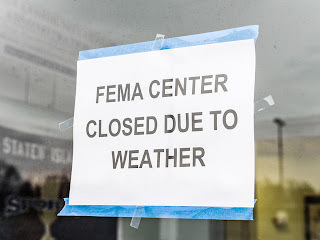 FEMA fails again, that darn George Bush. Still screwing up.